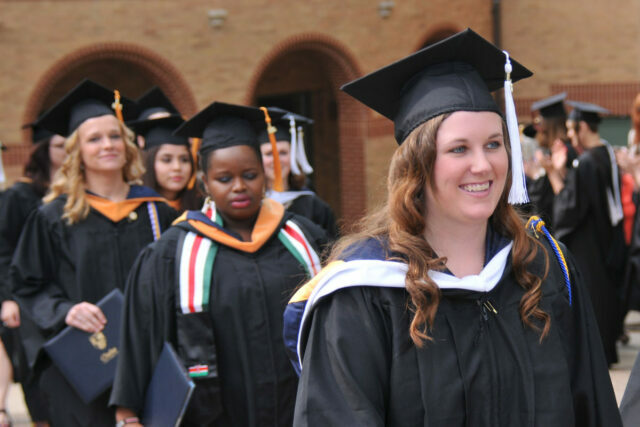 Clarke University will hold its 175th commencement ceremony on May 19, 2018, at 2 p.m. in the Robert and Ruth Kehl Center on the campus of Clarke University. The ceremony will honor bachelors, masters, and doctorate degree candidates from all academic programs. Graduates will be recognized for their achievements in front of honored guests, faculty, staff, classmates, and family members, many of whom have travelled from afar to attend the event. Senior class valedictorian Jessica Jordan will address the audience at the ceremony. Jordan will graduate with Bachelor of Science degrees in Biology and Biochemistry. The day begins with a baccalaureate liturgy at 10:30 a.m. at which graduates receive their academic hoods. Clarke University is honored by the presence of Archbishop Michael Jackels at the baccalaureate liturgy. The Commencement ceremony begins at 2 p.m. Graduates will receive their diplomas and degrees will be conferred upon both undergraduate and graduate students. Special awards will also be bestowed at Commencement. To accommodate additional guests, the liturgy and Commencement ceremony will be simulcast in Jansen Music Hall in the Wahlert Atrium. Clarke will also stream the liturgy and Commencement ceremony via Clarke’s website for off-campus viewing. For more information, contact the Clarke University Academic Affairs Office at (563)588-6406.